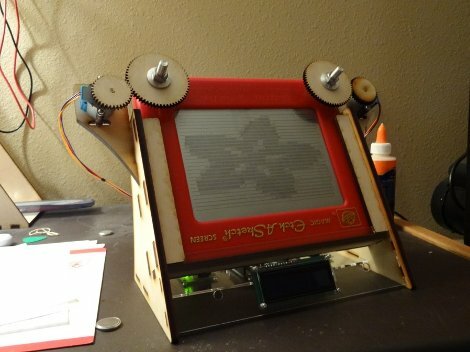 [Patrick] decided to make a computer controlled etch-a-sketch. While the idea is not that new, there is always a different way to accomplish a goal. An Arduino is used to control a pair of stepper motors which were sourced for pretty cheap, and even came with their own driver. Next a stand was mocked up using foam board, which helps determine where all the parts should live. Next was a way to attach the steppers to the knobs, gears would be used and a collet meant for model airplanes was sourced to make the mechanical connection between gear and shaft. With everything set in place via foam board and paper printouts, it is off to get some thin plywood. The plywood is sent though a laser cutter creating most of the stand and gears. Now its all software, a program was whipped up for OSX which converts low res pictures into squiggly lines perfect for the etch-a-sketch to draw on its screen. The results are quite impressive, join us after the break for a quick video. hmmmm? couldnt this be used to smuggle data? then you can have an erase button on the logic board to erase the memory and then you shake the etch a sketch to erase the message like usual. Or you could just read the memory directly. Advantage? Laughter and smiles… :) That is all. And it’s so fast !!!! Lovin this, though i cant help thinking weve just reinvented the HP single pen plotter from the 1980s. Time to start digging out those vector drawings of the space shuttle and we can go on a complete nostalgia trip. (BTW it should be plotting high res vector art, .svg files and hpgl plot files, never mind all the low res pixel nonsense). an etch-a-sketch ‘digital’ picture frame would be incredible. I don’t quite get your logic… to me that’s saying like a painter-bot is useless unless it can paint something better than the mona lisa. I’m quite sure you didn’t mean to sound like a troll, and don’t worry, you don’t. but it does sound like you didn’t think it through. Next make it print out a Twitter feed. But the real question is… Does it play crysis?